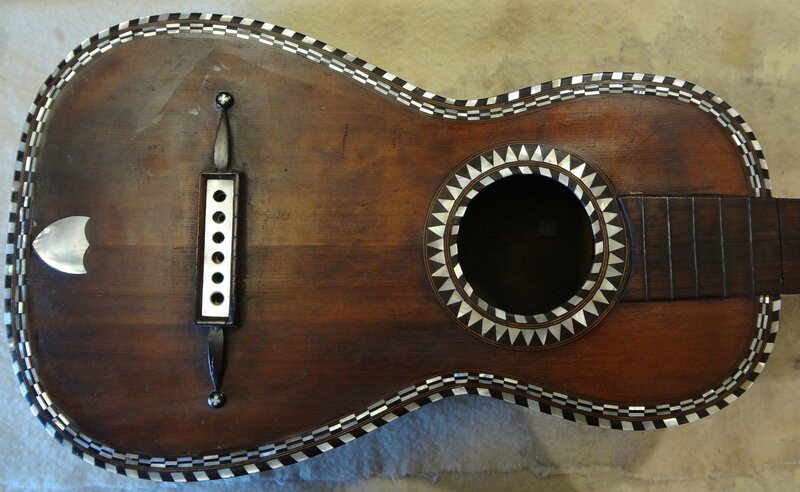 A small guitar, highly ornamented with ebony and mother-of-pearl, purchased from an auction. 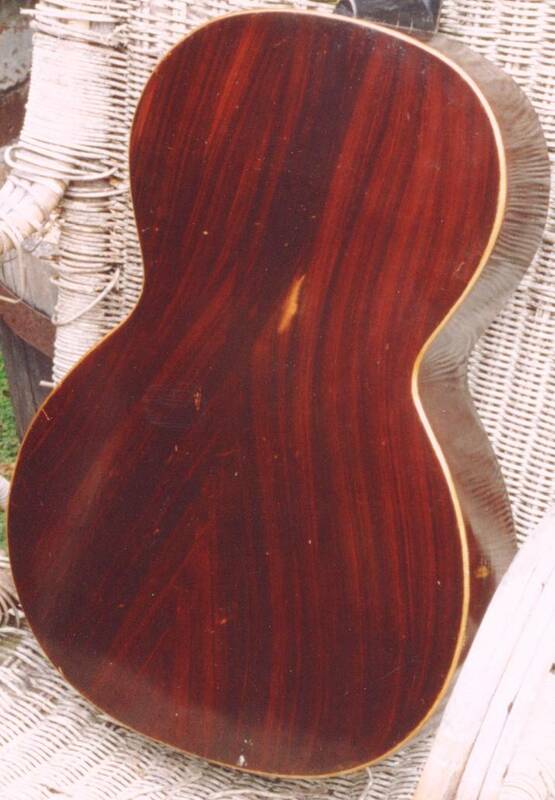 It is a beautiful guitar with Brazilian rosewood back and sides. The owner wishes it to be restored to play. 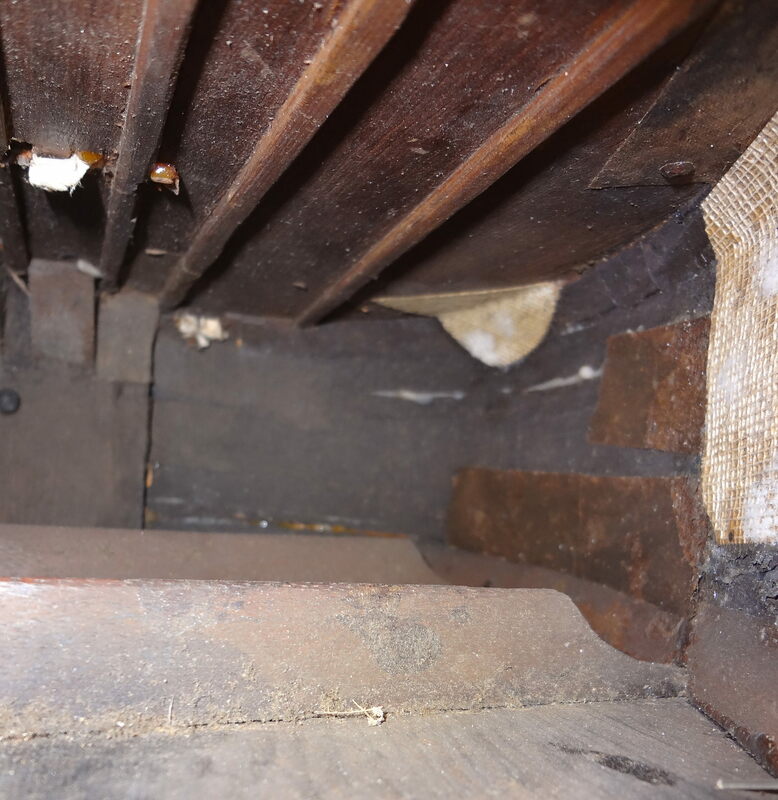 Below is the story of that renovation. 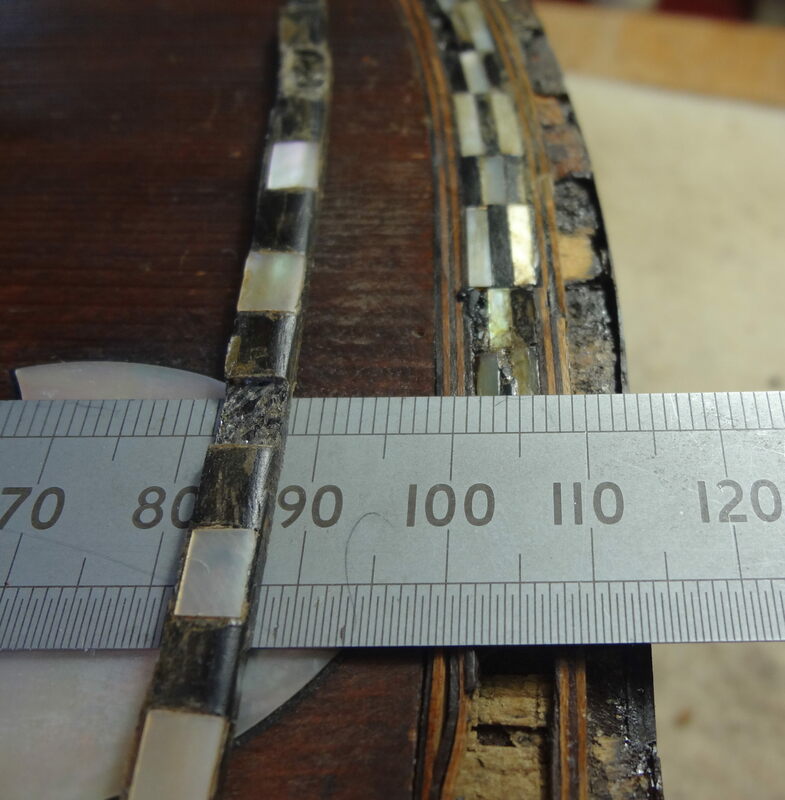 The guitar arrived in a very delicate state, the ribs are split and loose, the neck is not well attached, the back is coming away in places and it is shedding ebony and mother-of-pearl decoration. The instrument is weak and floppy and care is needed to move it. There is no label. 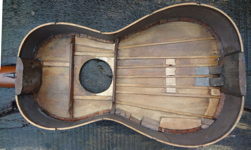 Two photos taken by a digital camera inside the guitar before the back was removed give a hint of the internal work that will be needed. 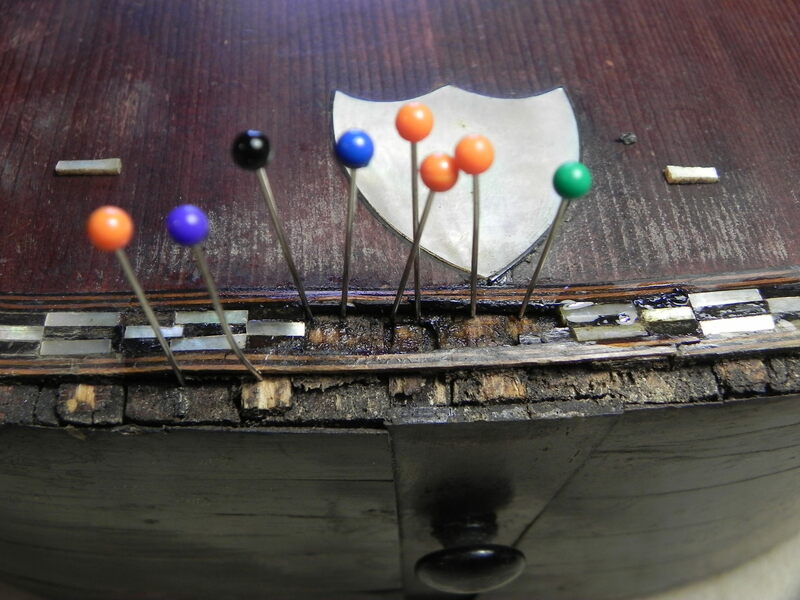 Before attempting any major repairs, one area of loose ornamentation needs work. Bits of decoration are falling away here and a temporary gluing will keep everything safe. 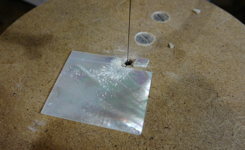 Hide glue works very well with the mother-of-pearl. The back removed. Three of the four back bars have remained with the body. 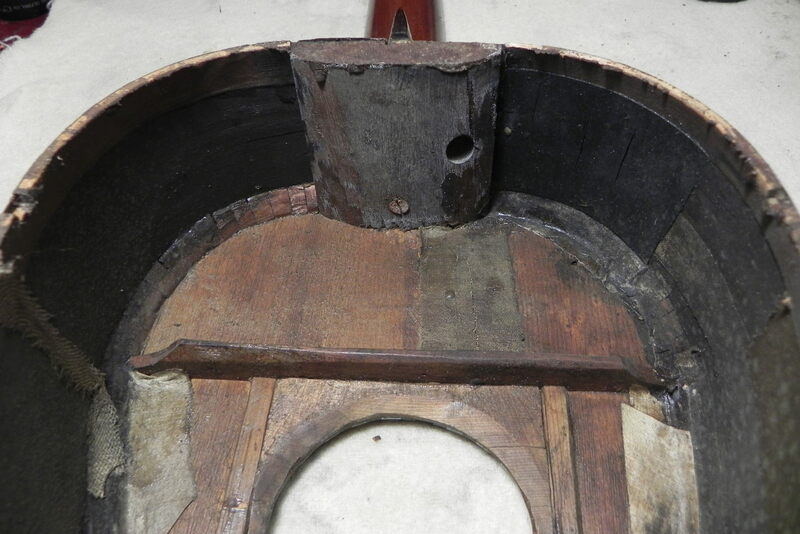 Both the upper and lower bouts show an incredible amount of linen reinforcement. 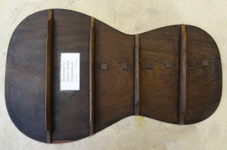 The upper bout has some dark wood veneer attached to the inside of the rib. All these old repairs will need to be replaced or renewed. Their added weight will be detrimental to the tone of the guitar. 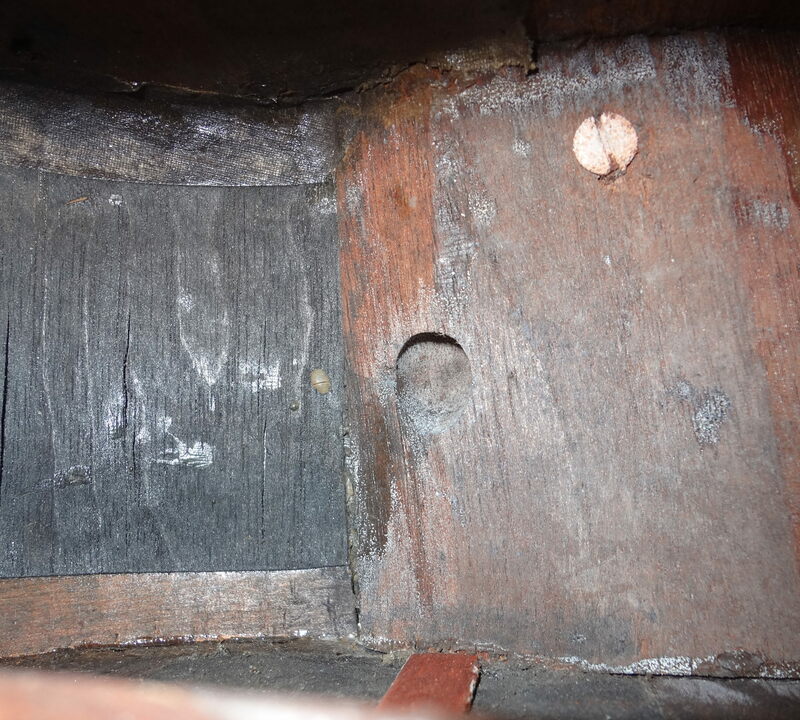 Note the rather large hole on the right side of the mahogany front block. It appears to have been made by a huge boring insect. Starting with the easiest work, I began on the back. I cleaned it and closed the big crack adding reinforcement dots. I reused the original mahogany bars and added my label. 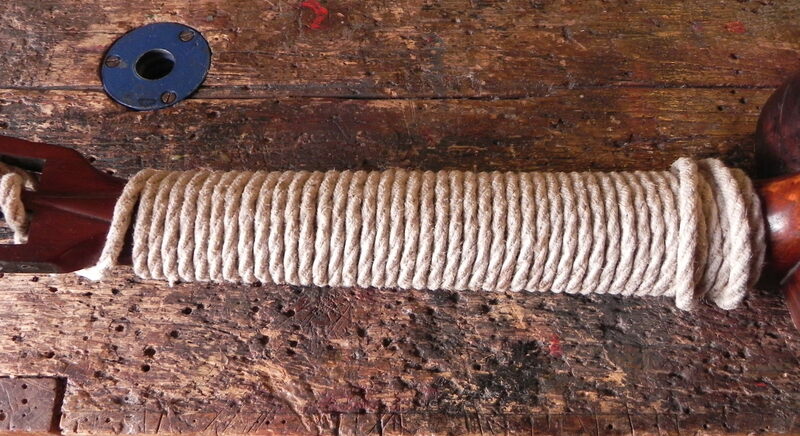 The original bars are about 7mm wide and have a maximum height of 20mm. 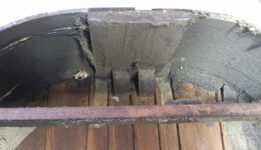 Both the front block and the rear block were not well attached to the soundboard. 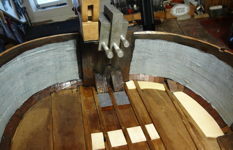 Here the front block is being glued to the soundboard. The fingerboard is coming adrift from the neck and rope is used as a clamp. 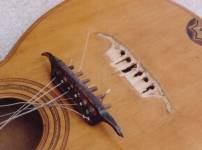 The guitar began to feel a little less fragile with the neck well attached. However it remained on a work board during the entire repair so that it would not have to be lifted. 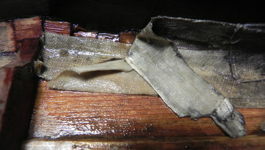 Old glue being softened where the back will meet the ribs and lining. 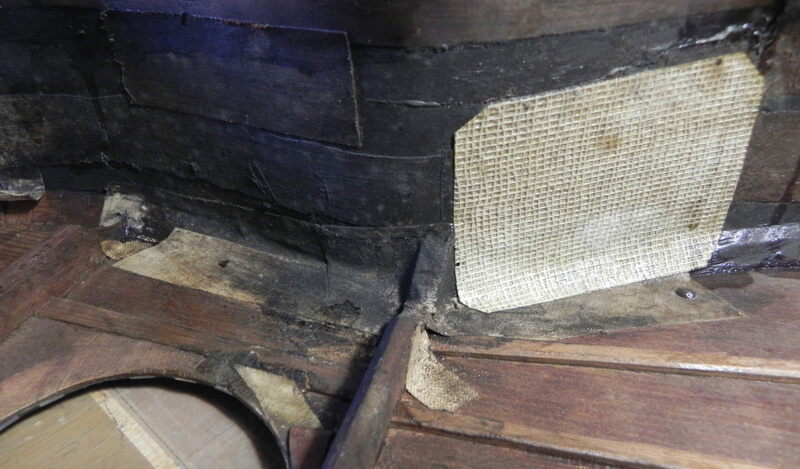 Also the first part of the linen and cloth rib reinforcement being softened for removal. Here is a large modern white patch and below it four layers of linen. The guitar will definitely sound better with all this removed. 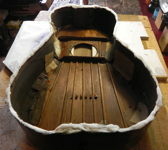 I removed the old cloth and veneer reinforcement in one sixth of the guitar at a time, adding new linen at each stage. This way only a small proportion of the guitar was under re-construction at any time. As I did this, the guitar grew stronger and stronger. 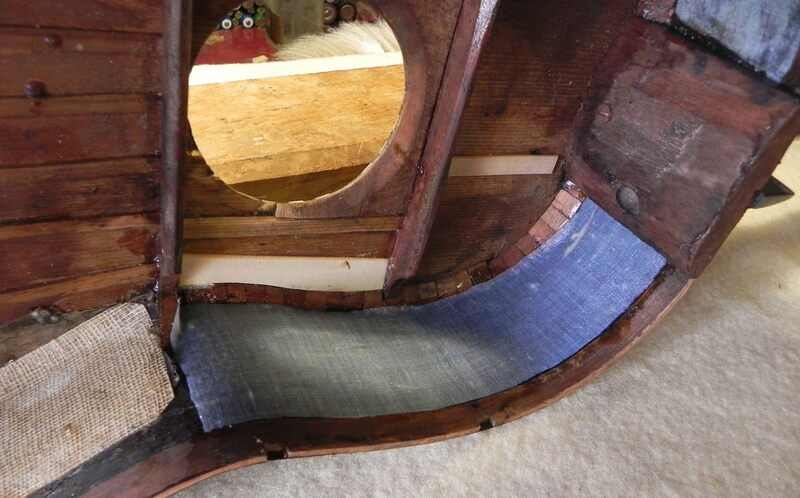 Eventually, the new linen reinforcement covered the entire inside of the sides of the guitar. Great care had to be taken with the ribs as they were so exceptionally thin, sometimes less than 0.5 mm. 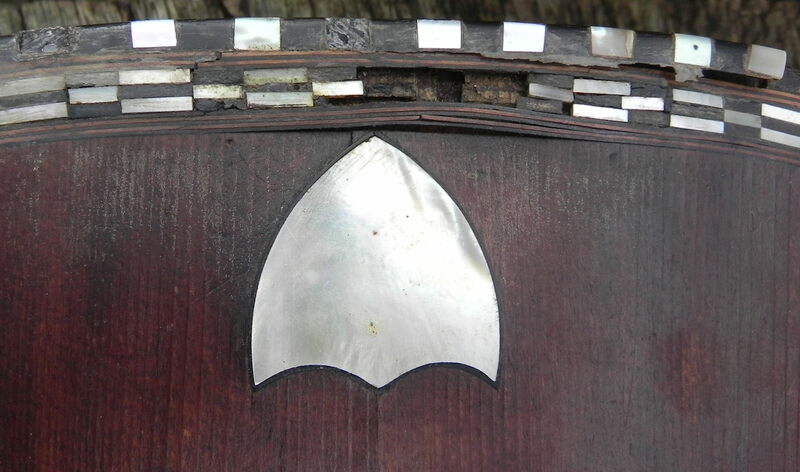 Also, here is one piece of ebony and mother-of-pearl decoration that came away as one piece and is ready to be returned to the guitar. 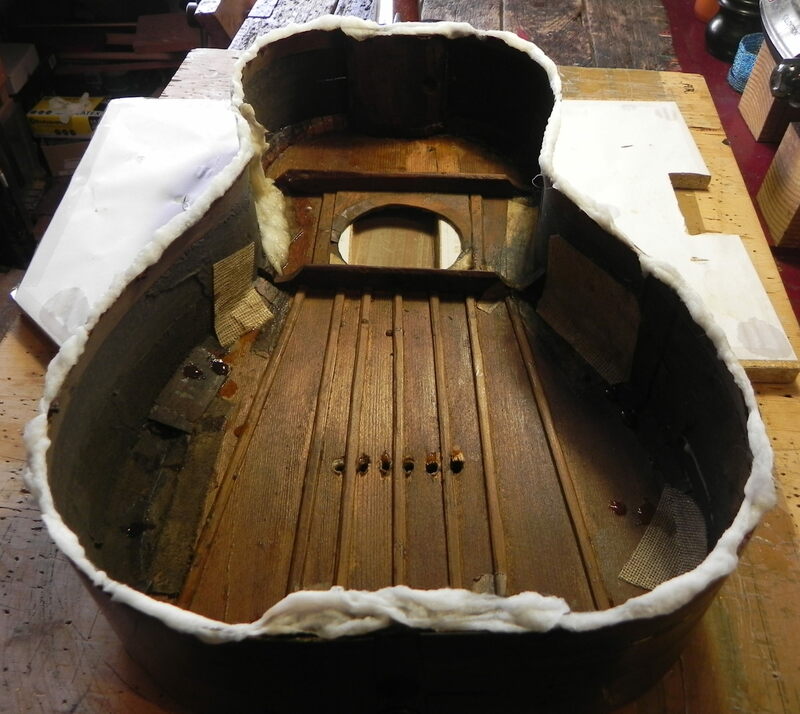 The work on the inside of the guitar is complete and the linen toned down so it will not be immediately visible from the sound hole. 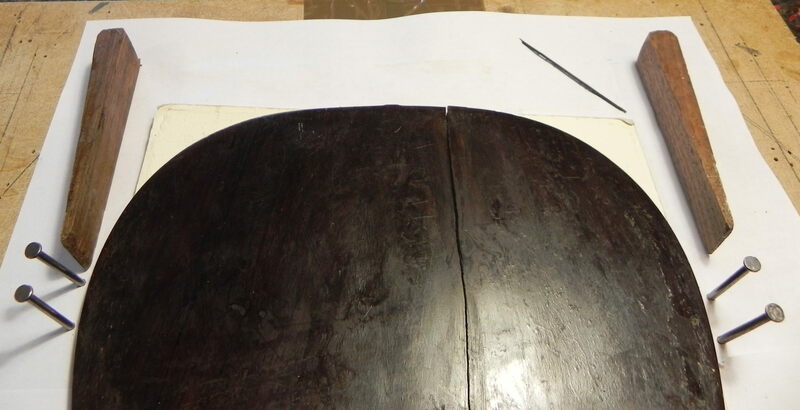 The next job is to replace the missing ebony and Mother of Pearl (MoP) inlaid decoration. I have decided to do this before replacing the back as I want that to be the absolute final stage. There is also a small repair in the front bout where the astonishingly thin rosewood has perished and a patch will be let in. I found no easy way to replace the MoP. 16 trapezoidal pieces of MoP were needed along with one ebony trapezoid. 7 each of MoP and ebony rectangles were missing. 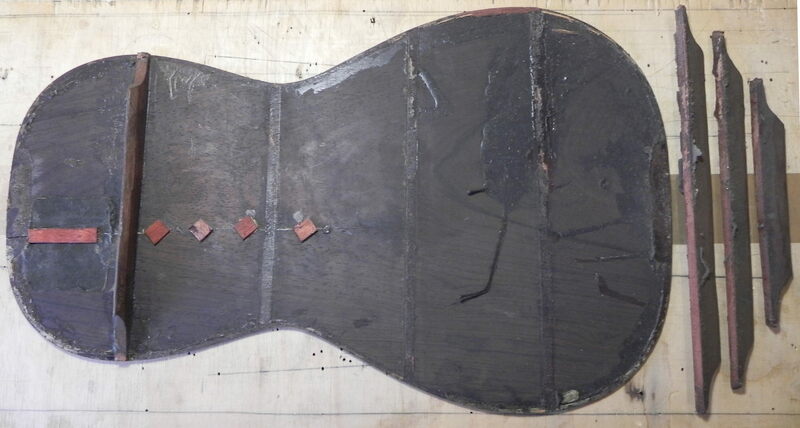 I cut the pieces on a pedal fret saw. 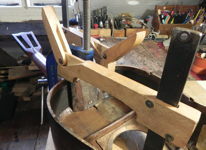 With the all work done on the body, the back was attached. When all was dry and I was satisfied, the guitar was strung with Savarez light gauge strings (White Card). The guitar sounds full and rich, astonishing for its small size. The picture of the finished guitar is at the top of the page. 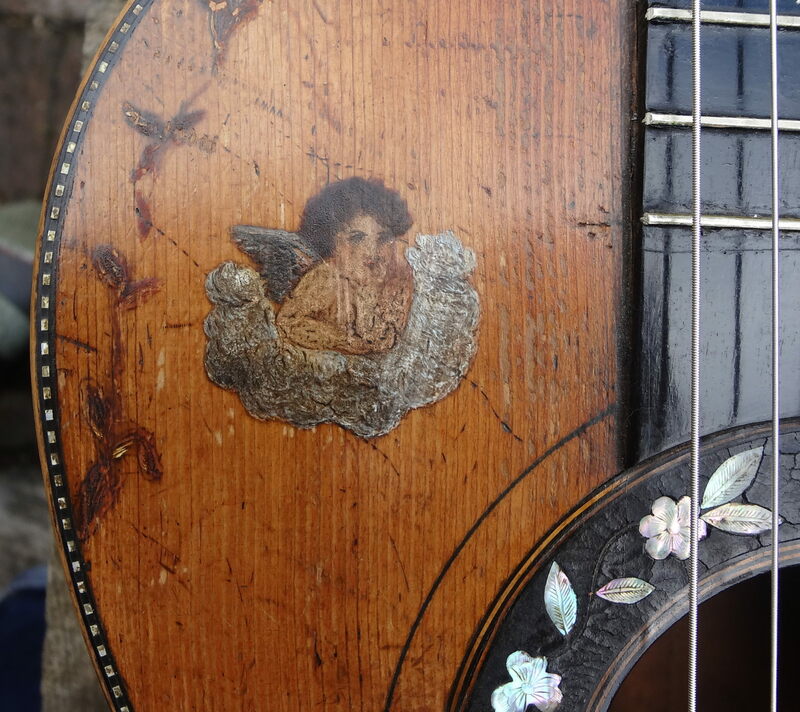 This guitar is probably French and was made in the early half of the nineteenth century. 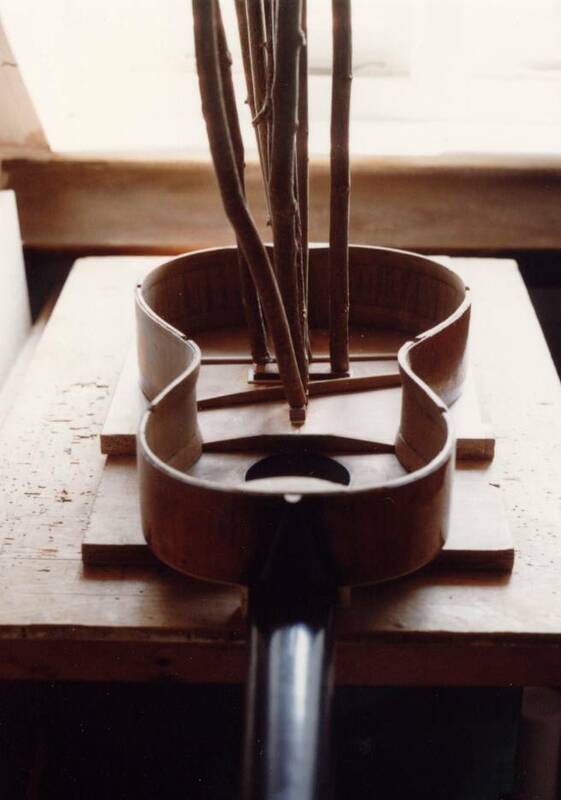 Note that the fingerboard does not go over the soundboard. 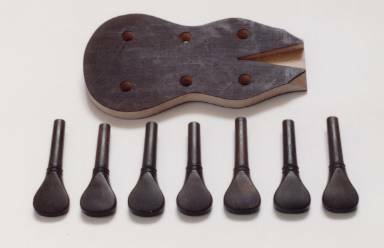 It arrived in the workshop with broken bars, many cracks, a large split along the joint of the soundboard and no peg head or pegs. 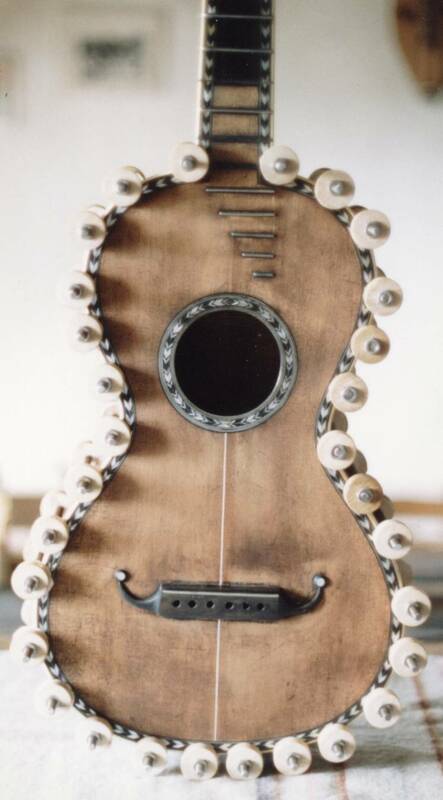 The owner chose to have the instrument restored to playing condition and asked for turned wooden tuning pegs that were probably on the instrument when it was made. 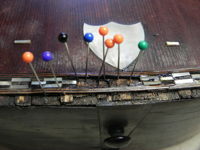 The guitar as it arrived, repairs in the workshop and the new peghead and pegs. Above the repaired guitar. 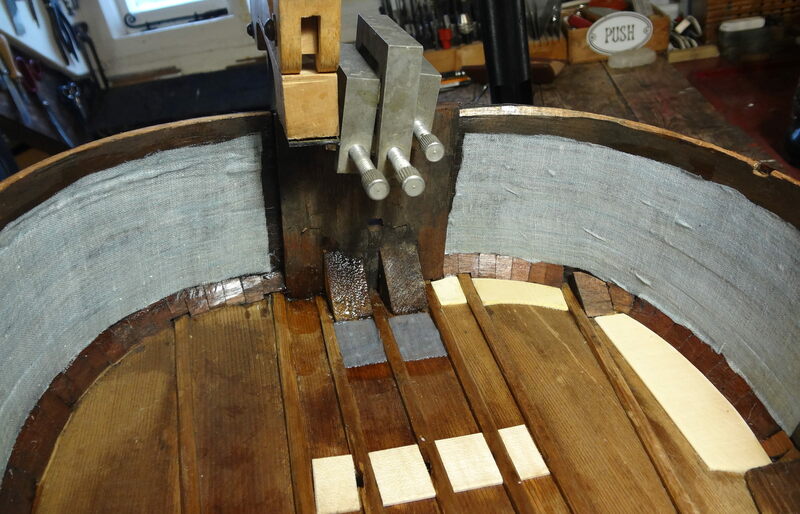 Bridges often come off, but usually not with quite so much wood torn from the soundboard. 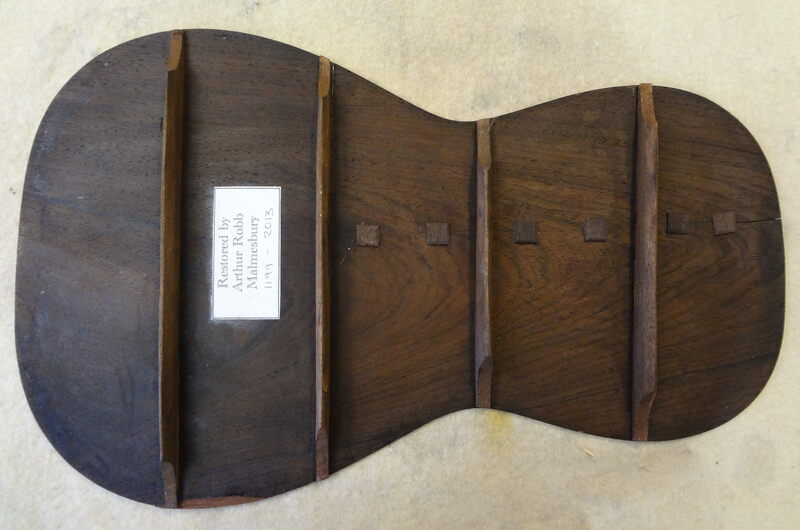 The guitar shows many charachteristics of the 19th century but also evidence of being a less expensive instrument. 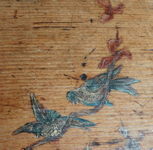 The fingerboard is not ebony but stained maple and the white wood has begun to show through the stain. 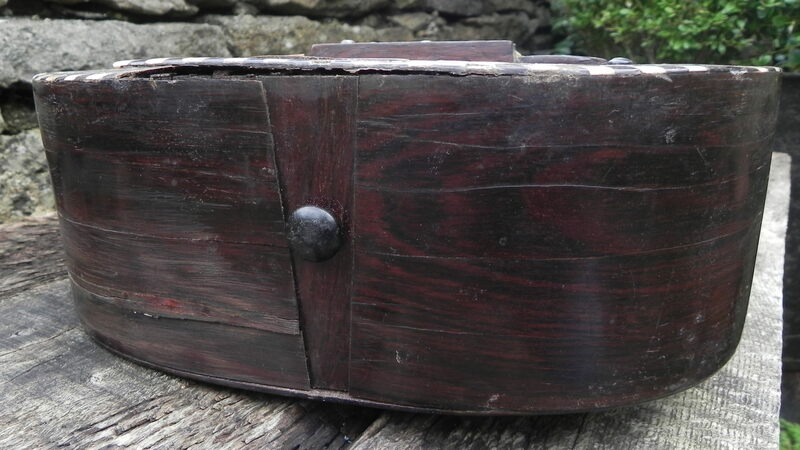 The back appears to be mahogony or rosewood but is again maple. It is painted brown and combed to give a grained effect. 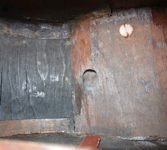 One light spot can be seen where the paint has worn away. 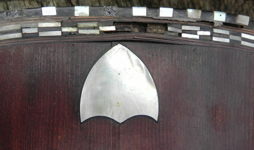 Although inexpensive materials have been used, the craftsmansip is of a high quality except for the head. 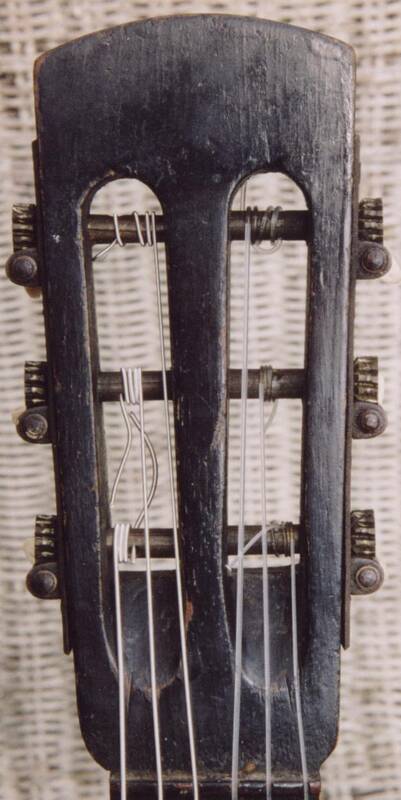 On the head, note the shoulders (at the bottom of the picture) are different shapes and that the strings do not lie nicely over the ramps. The woodworking is crude and this could replace an earlier head. 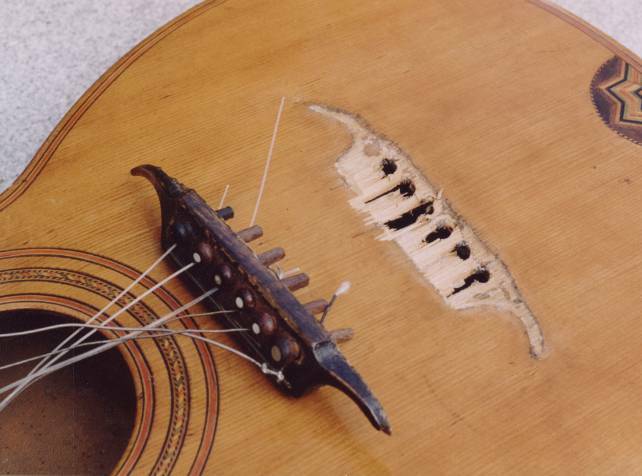 Only minor repairs were needed on this guitar. 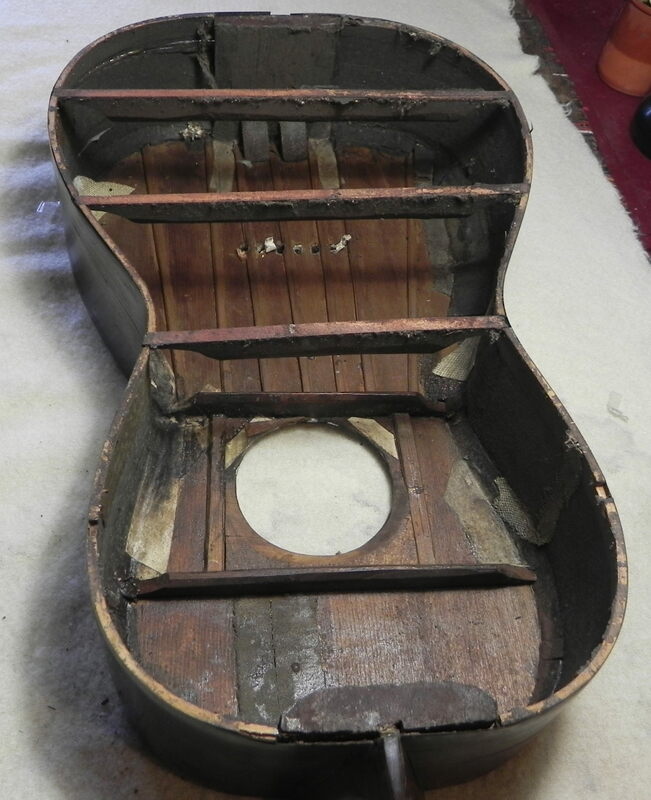 The guitar has been in the same family for over 100 years and was brought by the family from Sweden. Note the slanted frets. 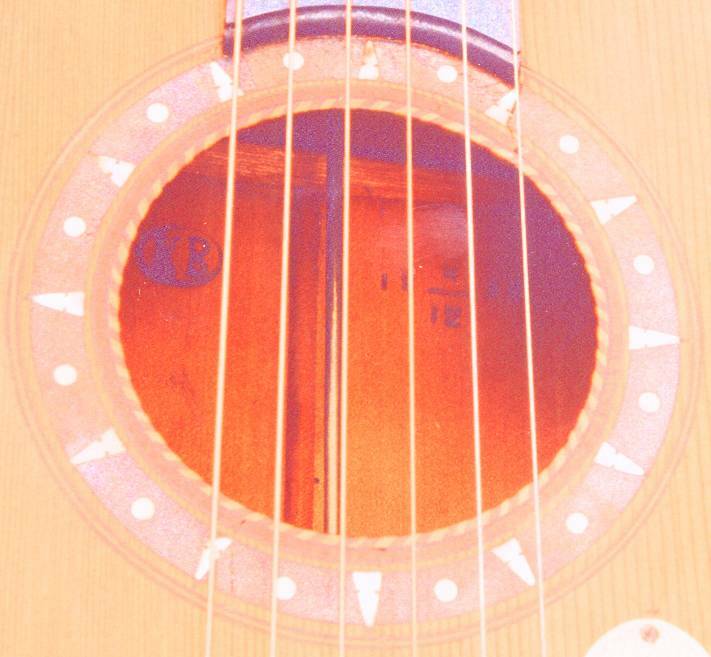 Click on the small soundhole above and the enlarged lightened picture allows the brands inside the guitar to be read. 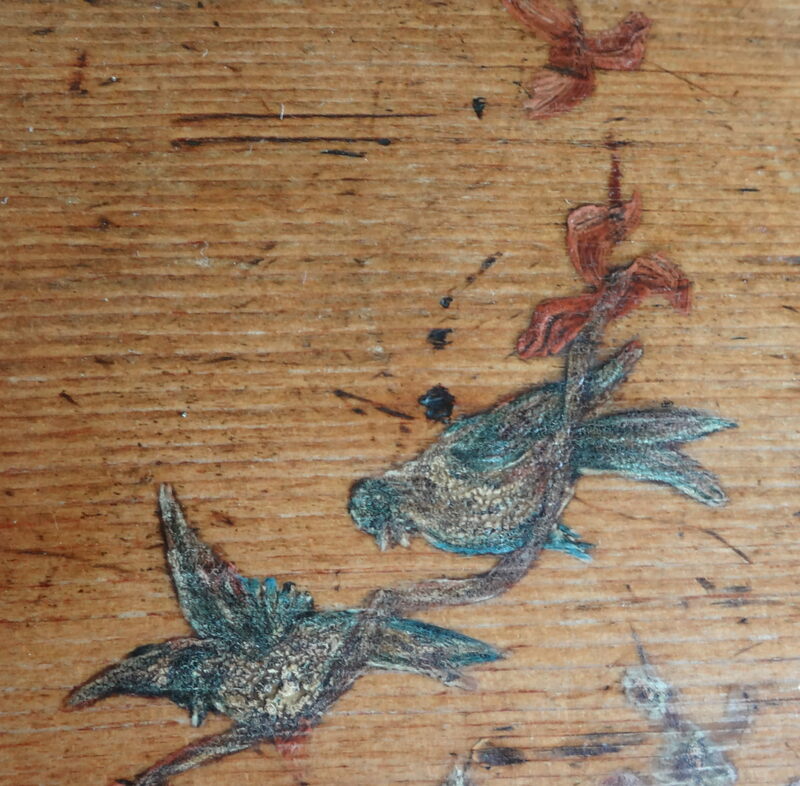 The makers initials are KB, in an ellipse, and the date is 4/12 96 or April 12, 1896. 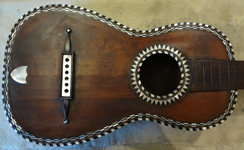 This guitar belonged to the owner's father who played it everyday. He was not the first to play it judging from the condition of the body. 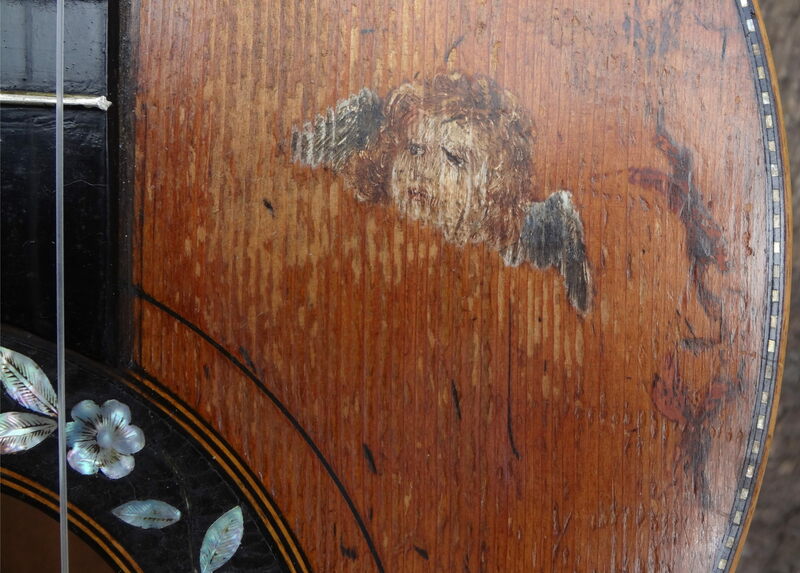 The body appears to be decorated with transfers, but on close inspection the figures are small oil paintings of angel faces, birds and vines. 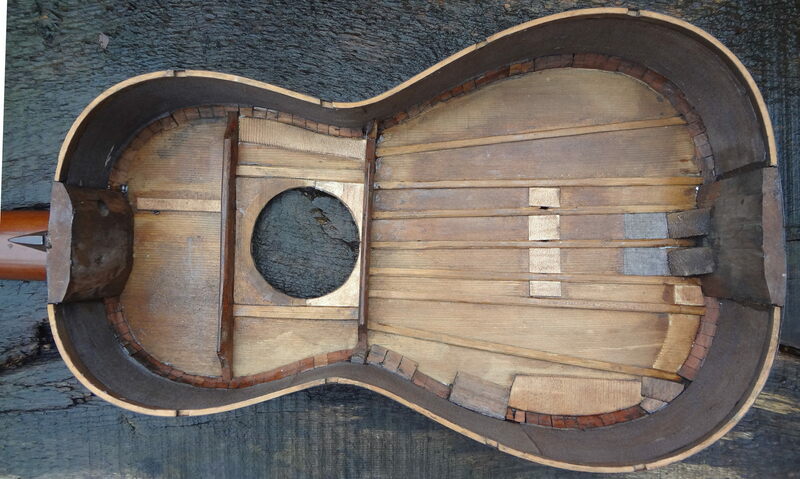 The paintings, and the entire guitar including the fingerboard, are varnished. 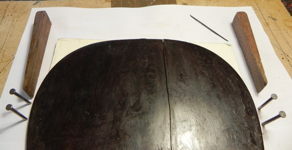 This varnish was applied after the guitar had been in use for some time as some of the wear on the soundboard has received varnish. 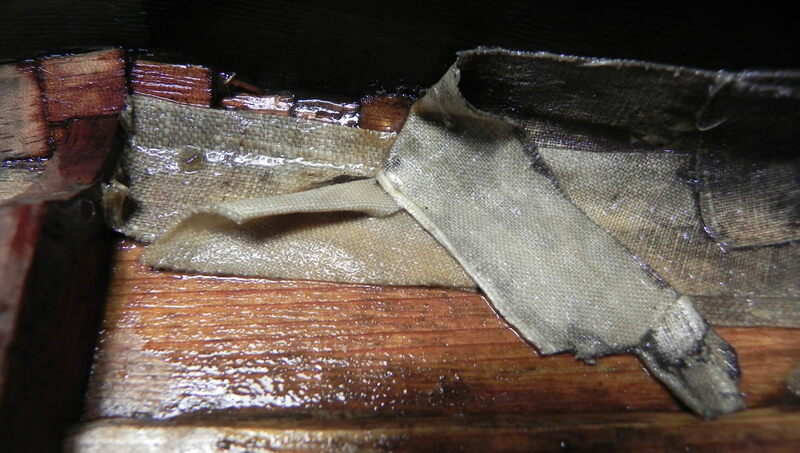 The fingerboard wear has gone through this varnish. 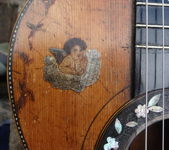 Even before the paintings were added, the guitar was beautifully decorated. The edging of mother-of-pearl and ebony is tiny and tasteful and the engraved and tinted mother-of-pearl is very beautifully done. 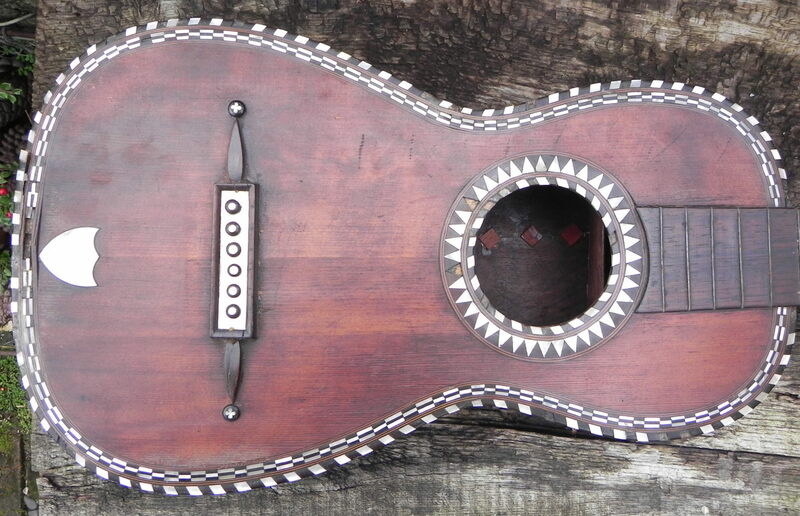 There is no label on the guitar but it is certainly 19th century. It has a small body with a wonderful tone typical of these small guitars.